Atlanta is the capital and most populous city in Georgia. As of the 2005, the city's population was estimated as 470,688, with an additional 4,917,717 people living in the metropolitan area. Perhaps the most famous educational institution in Atlanta is Emory University. Emory University is a private university, named after John Emory who was bishop of the Georgia Methodist Conference. Sports teams in Atlanta include the American football team, the Atlanta Falcons, the basketball team, the Atlanta Hawks, the ice hockey team, the Atlanta Thrashers, the Major League Baseball team, the Atlanta Braves, and the USL-1 soccer team, Atlanta Silverbacks. Some of the leading companies headquartered in Atlanta include BellSouth, Delta Airlines and The Coca-Cola Company. The main airport serving Atlanta is Hartsfield-Jackson Atlanta International Airport. 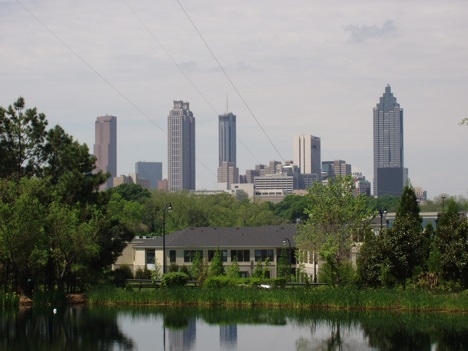 Atlanta is perhaps best known to non-Americans as the host city of the 1996 Summer Olympics. Atlanta's nicknames include "A-Town", "Black Mecca", "City in a Forest", "Dogwood City" "Empire City of the South", "Hollywood Of The South", "Hot'Lanta" "The A", "The ATL", and "The Big Peach".